Our colleagues in IAMI (the Indian Association for Medical Informatics), who are hosts and local organisers of the event, are pleased to announce that submissions are open for the APAMI2014 conference. See www.apami2014.com for full information and updates. Information on abstract submission is available at http://www.apami2014.com/abstractsubmission.html and the page for submission of the abstracts is at http://www.apami2014.com/abstract/login.php (note that you will need to set up an account). The deadline for Abstract Submission is 30th March 2014 at 23:59 hrs (local time). Registration is also open for the conference - see http://www.apami2014.com/registrationinformation.html - and the deadline for early bird registration is 15 May, 2014. On 21 January, we sent an email to all IMIA General Assembly members. As this newsletter has a wider distribution, we repeat the core content here. At the IMIA General Assembly meeting in Copenhagen, in August 2013, we discussed the issue of new Internet health domains, in particular the .health domain. The Board, and especially Prof. Antoine Geissbuhler, as our Liaison Office to the WHO, reported on activity in this area, and the GA supported further activity. Following a meeting attended by the current IMIA President, and including representatives from several NGOs. held in Geneva in December, we have sent a letter to the ICANN Board expressing our concerns about the allocation of new Internet domain names, especially those relating to health, and urging ICANN to "delay the allocation of .health and other health-related names until adequate safeguards, and baseline conditions for their implementation, are in place." Several other NGOs have sent, or will be sending, similar letters. (Thank you to our members who have taken action, especially the Spanish Society SEIS). We would like to encourage IMIA member organisations, and individuals, to also send similar letters to ICANN expressing their concerns and urging delay and reconsideration of the issues. We also ask you to contact your national Ministries or Departments of Health, and other organisations as you feel appropriate. See the news item at http://wp.me/pvCUS-1Rk for a suggested core draft letter - but please feel free to add to, or modify, any letter that you send. If you are able to send a letter, we should be grateful if you would send a copy to the IMIA Office. The HIMSS14 Annual Conference and Exhibition will be held in Orlando, Florida on 23-27 February, 2014. Full information is at http://www.himssconference.org IMIA is pleased to continue to endorse the event and encourages members to participate. One of the keynote speakers will be Hillary Rodham Clinton, Former Secretary of State and Former U.S. Senator from New York. Others speakers include Karen B. DeSalvo, MD, MPH, MSc, National Coordinator for Health Information Technology and Marilyn Tavenner, Administrator Centers for Medicare & Medicaid Services. The Nursing Informatics Symposium, on February 22-23, will celebrate its 10th anniversary. Registration is open. 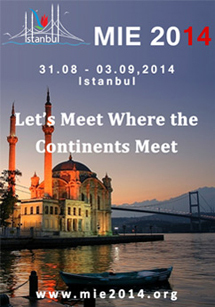 On behalf of the European Federation for Medical Informatics (EFMI), the Turkish Medical Informatics Association (TurkMIA) will host the 25th European Medical Informatics Conference - MIE2014 - in Istanbul, Turkey on August 31st - September 3rd, 2014. The deadline for submissions of papers and posters is extended to 07 February, 2014 - and the submission deadline for workshops, panels, short communications, and tutorials is March 3, 2014. The EFMI STC 2014 will be held at the Hotel Benczur, Budapest, Hungary on 26-29 April. See http://www.stc2014.org for this and more information as it becomes available. We encourage all colleagues - especially, but not limited to, those within Europe - to submit to and participate in both of these EFMI events. The IMIA and EFMI Boards will be meeting at this event. We ask all IMIA Member Societies and other members, and nursing/informatics organisations, to promote this event, which is held under the auspices of the IMIA-NI SIG (Nursing Informatics Special Interest Group). The theme of the conference is “eSmart + ” where “e” stands for eHealth, “S” implies simplicity, “m” represents mobility and meaningful use, “a” denotes advanced leadership, “r” indicates revolution, “t” means translational technologies, and “+” symbolizes People Leading uCare Safely. The acronym is also used to convey the idea of adopting smart technology to help health providers deliver higher quality care. The Health and Biomedical Informatics Centre (HABIC) - http://www.healthinformatics.unimelb.edu.au - at The University of Melbourne, Australia is pleased to announce that on 27-28 March 2014, a joint symposium between BioGrid Australia and the University of Melbourne’s Health and Biomedical Informatics Centre will be held at the Davis Auditorium, The Walter and Eliza Hall Institute of Medical Research. For full information, including registration (which is free and a first registered, first confirmed basis) is available at http://www.biogrid.org.au (see also http://wp.me/pvCUS-1P6). The International Conference on Big Data and Analytics in Healthcare (BDAH 2014) - organised by the National University of Singapore, Centre for Health Informatics - provides a leading forum for researchers, healthcare administrators, care-providers, and policy makers to disseminate and share cutting-edge research and practice, and gain insights into the challenges, opportunities, novel strategies, and analytic tools and techniques for dealing with big data in healthcare. The Call for Papers is open, with submissions due by 14 February (papers). Full information is available at http://www.bdah.org The event will be held on 22-24 July, 2014 in Singapore. Please notify the editor with any items that you think it would be useful to share in future issues. The purpose of this workshop is to bring together pattern recognition and healthcare researchers interested in healthcare analytics and applications of pattern recognition in this field. See https://sites.google.com/site/iwprha2/home for full information and dates. Abstract submission deadline is 01 March, 2014 and full paper submission deadline is 01 April, 2014. The workshop is co-located with ICPR2014, the 22nd International Conference on Pattern Recognition, on 22-24 August 2014 in Stockholm, Sweden (http://www.icpr2014.org). For information, please contact Jianying Hu, IBM T.J. Watson Research (jyhu[at]us.ibm.com). AMIA announce the Call for participation for the AMIA 2014 Annual Symposium. Full details are at http://www.amia.org/amia2014/call-for-participation The submission site is expected to be opened soon, and the submission deadline will be 13 March 2014 at 23:59 EDT. The latest issue of IFHIMA's Global News (Number 14, December 2013) is a 48-page special issue reporting and reflecting on the IFHIMA Congress held in Montreal, Canada in May 2013. The EFMI STC 2014 will be on 26-29 April, 2014 in Budapest, Hungary - http://www.stc2014.org The next MIE (Medical Informatics Europe) will be MIE2014 in Istanbul, Turkey. The dates are 31 August - 03 September, 2014. See http://www.mie2014.org and follow on Twitter @MIE2014 (https://twitter.com/MIE2014) MIE2015 will be held in Spain.